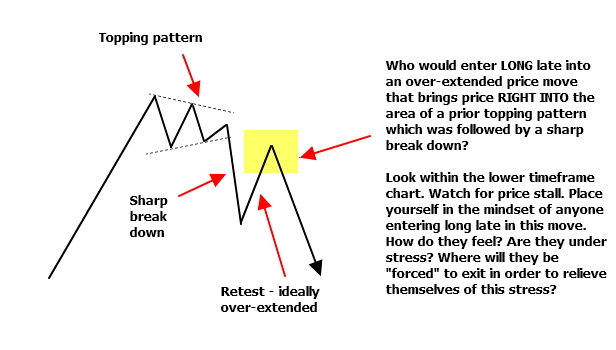 As price moves into my setup areas, "the other trader" is always at the forefront of my mind. Who created this recent move against market bias? Are they trapped? Are they feeling stress? Where is the point of extreme stress at which they'll bail out of their position? 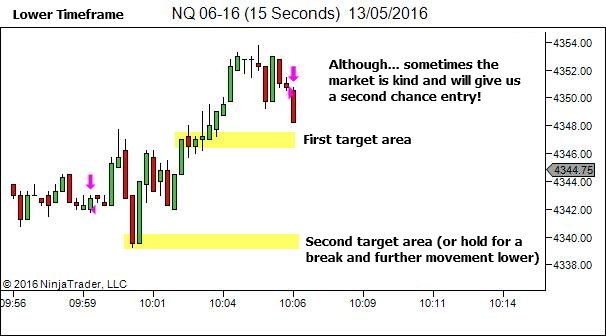 In recent weeks we've looked at some examples which include a break of a key level, which then stalls and fails. 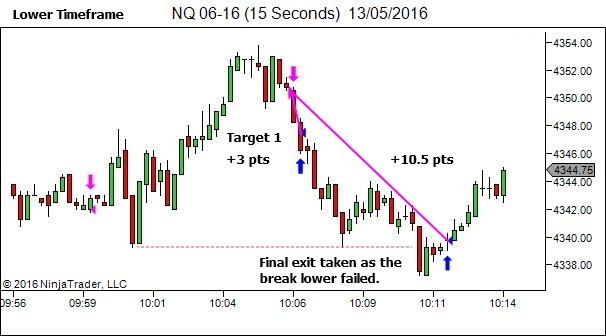 These type of trap scenarios provide some of my favourite trade entries. 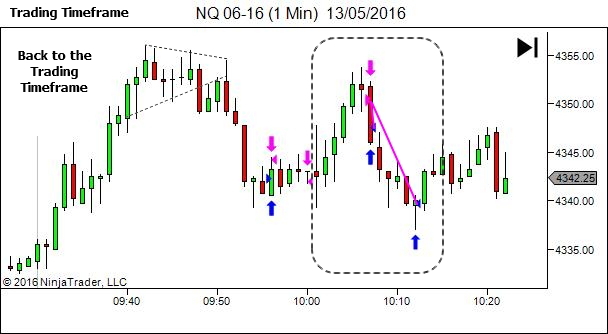 But we don't always need a break of a level in order to find trade opportunity. 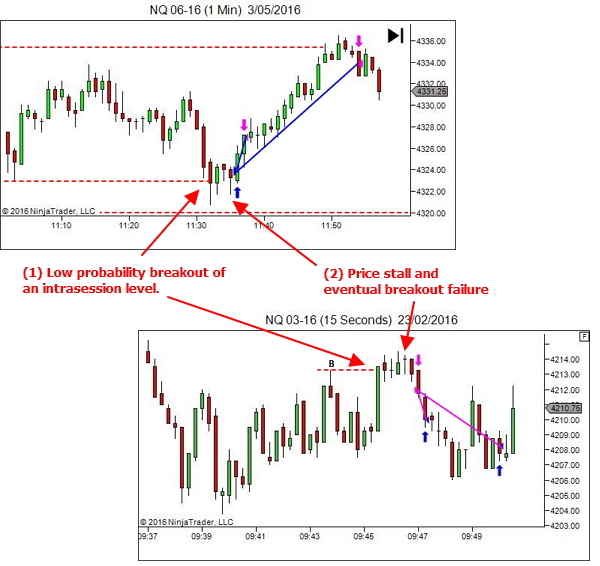 What we're looking for is a move, against market bias, into a REALLY LOW PROBABILITY place to trade. Reality is never as nice as these "text book" line diagrams though. So let's look at a real-world example. There is no way I'm going to immediately fade such a move. It's not my style to step in front of any strength like this. Maybe these late buyers know something I don't know. Maybe the momentum will continue right through the High of Day. But… what if it doesn't? What if price does stall? What if the late buyer is placed under extreme stress? This could perhaps offer us entry short, for a snap back towards recent lows. So let's zoom in to the lower timeframe chart to see what happens. Place yourself in the mindset of anyone who entered late in the initial rally. Perhaps someone who jumped on board the massive spike of momentum as price accelerated into the highs. How would they feel during this stall? Perhaps a little concerned, I guess. But certainly I don't imagine they'd be giving up yet. 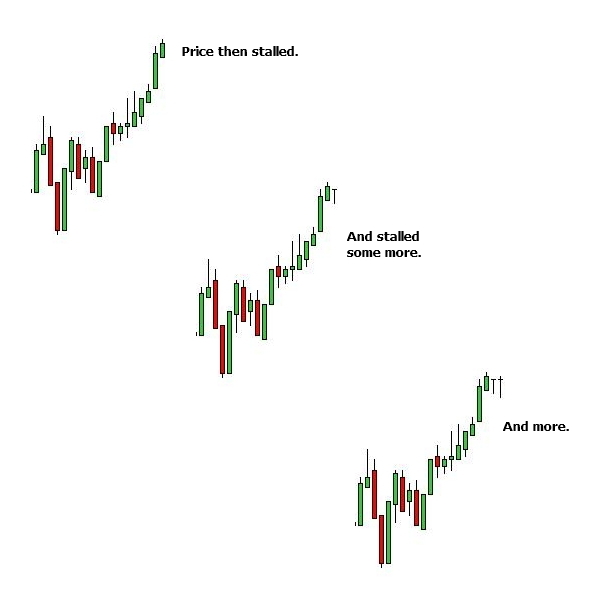 It still "looks" like price wants to rally. Great article, I found great to read not just about technicals but also process of preparing and taking the trade. Real time trading. Its really big value of your work. And I got a question: 2nd target was pretty obvious but the 1st, for me its just a one-bar pullback from this pretty strong leg up. Could you write sth about it? 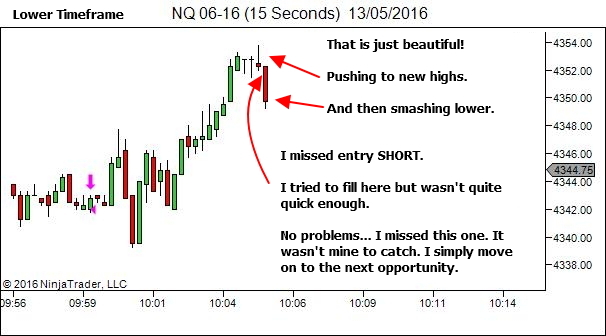 If you look to the 1 minute chart at 10:00 you’ll see a long-legged doji (very wide bar with long upper and lower tails). This was a news release that caused a sudden spike in volatility. 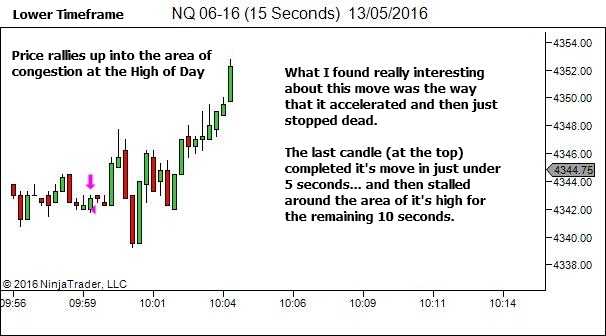 You can see it on the 15 second lower timeframe chart as well, as an initial spike up and then down. 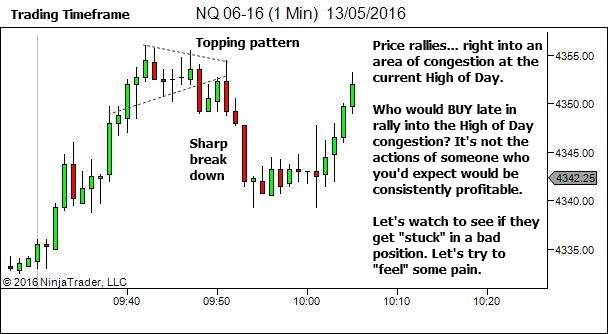 The first target was the small area of congestion where price broke the highs of this news spike. There was potential for some reaction at this point so I was happy to take partial profits. Hindsight showed that it wasn’t necessary to exit at all. So be it. I trade very defensively and my initial exit quite often underperforms. Great article! An essential reminder to always do our homework (as amply elborated in the course) before jumping to conclusions. Lance, I really like the way you show your thought processes with screenshots of the chart to illustrate the points in time. No one else does this, it’s like a trader’s comic book! I’m learning a lot this way. I’m reading your lost blog posts from 2011 on (slogging through the bogs), and reading the recent ones going backwards. The things you talk about with traps etc are all good techniques for price action trader, and people need to realize it’s gold. I’ve been following Mack at P.A.T and your studies are complementing what I’ve been trying to do perfectly. 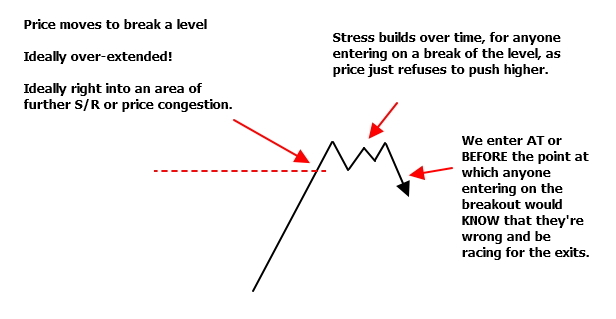 You tell it like it is, there is no shortcuts, there is hard work, price action is the way to go. (Enjoyed your Chat with Trader as well). Keep up the good work, I appreciate it. Thanks. tcat92, Thank you so much for your kind words. Agreed. The apex of the triangle is a great place for a short. If I recall right it dropped too quickly for me to take action.